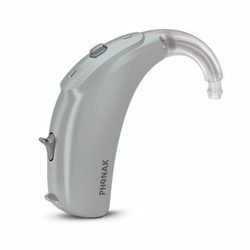 Offering you a complete choice of products which include phonak naida v90 sp power bte hearing aid, phonak naida v90 up power bte hearing aid, phonak naida v90 crt ric bte hearing aid, naida b30 bte, bolero b30 bte and naida b50 bte. 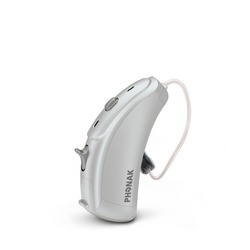 The Naida UP is the most powerful model within Phonak's specialist power hearing aid portfolio and is a power BTE, designed to be coupled with a custom ear mould. It uses a size 675 battery for 14-21 days battery life. It has up to 85dB of extra volume available and is rated IP68 for superior water and dust resistance. It features a program button and separate volume control on each aid. 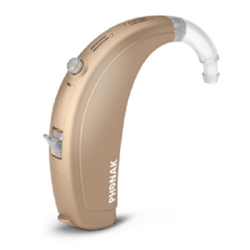 The 90 series hearing aids (V90) represent the pinnacle of innovation and technology from Phonak. 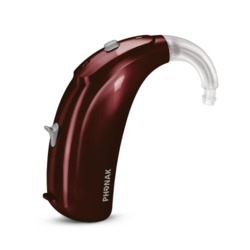 Developed for an active user, these hearing aids are designed to cope with everything life can throw at them. Fully wireless and capable of streaming both external sounds and signals from each other, they have all of the latest features built in. For the person that wants the best, and who leads an active and social lifestyle, the 90 series will be very hard to beat. Block, auto Acclimatization, Tinnitus Balance noise Generator, Fully Wireless, Broadband Booster, Ip68. Features: Autosense Os Essential, SoundRecover2, Ultra Zoom Essential, Noise Block Essential, Whistle Block, auto Acclimatization, Tinnitus Balance noise Generator, Fully Wireless, Broadband Booster, Ip68. Features: Auto Sense OS Standrad, SoundRecover2 , Ultra Zoom Standrad , Real Ear Sound, Flex Control, Noise Block Standard, FlexVolume, Sound Relax, Whistle Block, Duo Phone, auto Acclimatization, Tinnitus Balance noise generator, Fully Wireless, Roger Ready, Broandband Booster, IP68. Features: Auto Sense OS Standrad, SoundRecover2 , Ultra Zoom Standrad , Real Ear Sound, Flex Control, Noise Block Standard, Flex Volume, Sound Relax, Whistle Block, DuoPhone, auto Acclimatization, Tinnitus Balance noise generator, Fully Wireless, Roger Ready, Broandband Booster, IP68.